Counter Terrorism Policing South East (CTPSE) continue to investigate the circumstances around a stabbing which took place in Stanwell, Surrey on Saturday evening (16 March). A man has been charged with attempted murder and possession of a bladed article in a public place in connection with the stabbing of an 18-year-old man in Redhill in January this year. We stand together with our Muslim communities and all those shocked and horrified by this terrorist attack in New Zealand. Today in Surrey and Sussex we are stepping up reassurance patrols around mosques and increasing engagement with communities of all faiths, giving advice on how people and places can protect themselves. 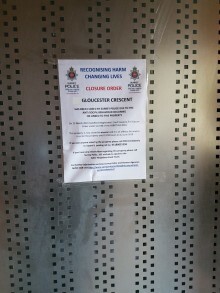 ​A property in Gloucester Crescent in Staines has been granted a full Closure Order following reports of anti-social behaviour and drug dealing. ​We’re appealing for witnesses following an aggravated burglary in Ash Green last night (March 13). Two men have been sentenced in connection with a series of keyless car thefts which saw up to £250,000 worth of cars taken from driveways across Surrey and South West London. The charges relate to twelve offences where thirteen high-powered cars, including BMWs, Range Rovers, a Mini and a Jaguar were taken. We are pleased to announce that the vulnerable missing 16 year old girl from Horsley we appealed for your help to locate on Wednesday, 13 March has been found safe and well. A convenience store in Camberley has had its premises licence revoked following a hearing on Monday (11 March). Three men have been sentenced to 43 years combined for killing a man on an island near Sunbury Lock in July 2016. ​We are appealing for witnesses after three masked men stole a large quantity of cash after breaking into a property in Farnham on Saturday evening (9 March). We’re appealing for information after a restaurant in Farnham was deliberately set on fire. The fire service was called in the early hours of Monday (11 March) to tackle the blaze. 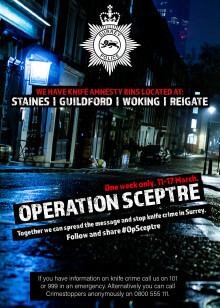 From today (Monday, 11 March), Surrey Police, together with other forces, will be supporting a national anti-knife crime campaign which aims to reduce the number of people carrying a weapon. We are urgently appealing for information and witnesses following an incident in Woking in which a man in his 30s was found with life threatening injuries. ​Two people have been arrested in Bookham after officers conducted a drugs warrant. ​A 14-year-old from Sunbury was arrested yesterday (7 March) on suspicion of conspiracy to commit robbery in relation to the incident in Thames Ditton on 12 January where a 16-year-old was stabbed.